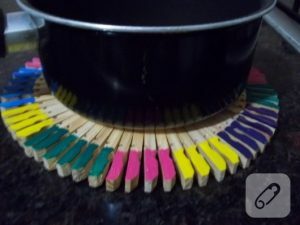 Materials needed to latch the trivet made wooden pegs colored paints and a little hot silicone adhesive. 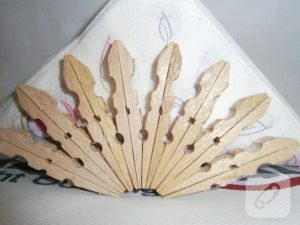 If you thought why we use wooden pegs, wooden pegs will not stand for plastic latches hot silicon will be more healthy. First and pasting paste is a kind of catch shaped flowers with hot silicone from taking the upper part of the wire are starting to work. Afterwards, we left to dry in the colors we express our pot pad, even we are beginning the coloring process by colorful paints. 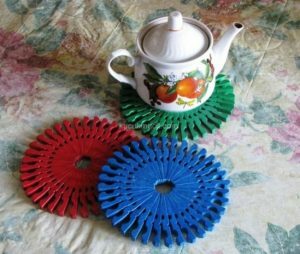 Painting process when we have completed the dry parts with painted trivet is ready for use. If desired touch with varnish over the paint can to prevent damage. From the outside temperature, the water can maintain the effect and so on. Here you pot pad no actually latch the trivet made it so easy. 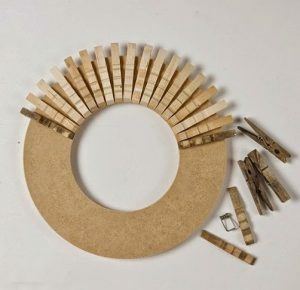 We can do this with a few pegs we use at home. You want to benefit from the old ware house, you can also other pages on our site. 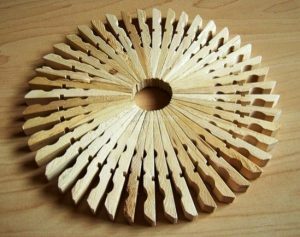 DIY projects are receiving considerable attention. To obtain new ones from the old stuff or object is quite enjoyable. Both expands your imagination, you have to evaluate your leisure time as well.